As 2012 draws to an end it is easy to look at the numerous accomplishments and innovations that have taken place in data centers across the globe. Unfortunately, the latter portion of 2012 also provided a stark reminder of how important of a factor the location of data center really is. Hurricane Sandy tops the list of most talked about natural disasters within the data center industry and for good reason. This provides the perfect opportunity to take a closer look at recent natural disasters, particularly hurricanes, and how they have affected data centers across the country. 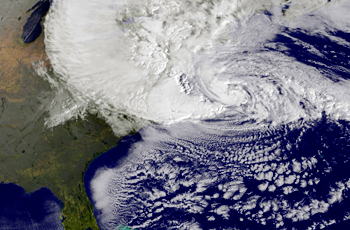 This year’s hurricane season will chiefly be remembered for Hurricane Sandy and Hurricane Isaac. Both of these hurricanes were extremely destructive. This makes it easy to overlook the fact that there were nearly 20 hurricanes and tropical storms in total. In fact, the first hurricane (Chris) appeared in June which is several months ahead of the traditional beginning of hurricane season (August). Most people assume that once a hurricane has dissipated the real damage has already been done. The truth is the days following a hurricane are when the most damage occurs. Stemming from the initial damage, power outages and flooding can quickly cripple a data center which structurally survived the storm. One of the best illustrations of the damage which occurs after a hurricane has passed was seen at a data center on 75 Broad Street in Manhattan. Both Peer1 Hosting and Internap were forced to shut down operations following the power outage because the basement level completely flooded. Unfortunately, this where the backup generators were located which means the essential diesel fuel pumps were completely disabled. Even after receiving emergency fuel, additional emergency pumps had to be brought in and set up. A similar situation arose at 33 Whitehall Street when Datagram was forced to shut down their data center as well. This is why popular websites like The Huffington Post, Gawker, and Buzzfeed were all offline following Hurricane Sandy. To make matters worse, the preparation before a hurricane hits is rarely enough. Data centers in the path of both Hurricane Sandy and Hurricane Isaac had more than enough time to begin implementing their emergency precautions. This included getting more fuel, testing backup generators, and preparing to maintain services following the disaster struck. Unfortunately, all of the planning and preparation was inadequate. While predicting the exact location or the extent of the damage natural disasters cause is impossible, selecting a data center which is at a low risk of being affected is much easier. There are a handful of locations across the country which are located outside of every major natural disaster zone. Contact us today to discover which fully redundant, purpose-built data centers are located in low risk zones and provide the ideal protection for your valuable equipment and data. Why Selecting a Carrier Neutral Colocation Provider is So Important? Over the past decade, more and more data centers are offering multiple network carrier choices to customers in order to guarantee maximum connectivity and increased market competition. Not only are there a variety of cost benefits to utilizing a carrier neutral colocation facility, but there are also a number of items which are avoided by using a carrier neutral facility. One of the easiest benefits to identify is the increase in flexibility. By selecting a carrier neutral colocation facility, businesses have the ability to select from multiple carriers. This allows them to minimize costs while maximizing bandwidth speeds. It also provides an easy way to set up connectivity related redundancies based upon each businesses specific disaster recovery strategy. Another benefit of selecting a carrier neutral colocation facility is it eliminates the potential for a conflict of interest to arise. When data centers are tied to a specific carrier, they lose the ability to provide the best service possible to their customers. Instead, they are only able to offer what the carrier chooses to provide. This forces the data center to act as an advocate for the carrier rather than an advocate for their customers. In order to cut costs, it is important for businesses to have the ability to react to market changes quickly. Over the past several years, bandwidth pricing has come down as new carrier routes are established. Using a carrier neutral colocation facility allows businesses to explore new ways to cut costs as the carrier markets change and prices fluctuate. Carrier neutrality within a data center also increases competition between carriers, further reducing prices. An overlooked benefit of selecting a carrier neutral data center is that the colocation provider gains the opportunity to focus on their core services. Colocation facility connectivity becomes a choice which is made by individual companies rather than the data center. This allows the provider to address additional needs of their customers without a conflict of interest or be restrained to only offering pre-built packages. What Are the Cross Connection Fees? Cross connection fees will vary from one facility to another. Some colocation providers which claim to be carrier neutral utilize high cross connection fees in order to subtly push their customers towards a particular carrier. Not only does this increase costs for businesses, but it also makes it more difficult to build connectivity redundancy within their network. How Fast Are Carrier Changes? Another question to ask is how fast the carrier changes are. Quality colocation providers can switch the carrier used by their customers extremely quickly. Lower quality providers may force the business to wait until the next billing cycle before the carrier change takes place. By remaining carrier neutral, colocation providers and their customers find themselves in a win-win situation. Colocation providers gain the ability to focus on their core services and enhance their customer’s experience. Businesses benefit from improved flexibility, decreased connectivity costs, and can select providers knowing a conflict of interest will never arise. Colocation facilities are able to simulate large IT infrastructure features that normally only enterprises can enjoy. Setting up a private data center with every feature including redundancy, security and reliability can be very costly. Colocation can be a huge cost saving service for companies of all sizes and is a growing trend even among some larger enterprises. This trend can be attributed to two things. First, in this economy, many companies are trying to cut costs. Competition within every industry has increased greatly, prompting enterprises to cut down on costs in order to maintain profitability. Second, by placing all of the responsibility of IT management on colocation facilities, firms can concentrate on their core functions. How do you compare the cost of these two drastically different approaches? Here is an estimation example. For single server space, a colocation facility will probably charge around $100 per month. In addition, there are also costs associated with the provision of bandwidth and Internet connectivity. These can total over $1,000 per month for a connection with a speed of 100 Mbps. These costs also include the redundancy features that are provided by colocation facilities. It must not be forgotten that such facilities have a network, power and cooling infrastructure that is typically completely redundant. Also these facilities provide top level security, which is included in colocation contract fees. Now, compare these costs with the costs of setting up a similar in-house data center. Simulating the infrastructure and services that are provided by colocation facilities can be much more expensive. The average cost to construct a data center from the group up ranges from $20 – $25 million dollars. This cost doesn’t take into account the ongoing operational cost of the facility. These facility cost can start to add up quickly. Colocation facilities lower the cost for each customer by splitting the total cost across multiple different companies. In addition, they also feature multiple provider options. This is a main reason behind their reliability and server uptime guarantee. Colocation facilities also incur the energy costs associated with operating the servers and ensuring their temperature is regulated via cooling systems. These costs are already included in a company’s fee. In addition, colocation can spread them across all their clients, meaning each customer will end up paying less. When a privately owned setup is established, these costs are realized fully by the business itself. They have to deal with their energy use and remember to handle the bill when it comes. The cost of a trained staff of IT professionals is also something that should be kept in mind. Within colocation facilities, IT personnel are present at all times to assist with a variety of tasks. The initial installation of the servers and other equipment requires expertise that colocation facilities specialize in. In addition, making sure that hardware and software malfunctions are fixed instantaneously require their presence, as well. This type of availability and expertise is not easy for private data centers to maintain. It often requires the creation of a whole department or contracting with a technician to be on call. These both are costly for companies that may not have extra capital on hand. Consequently, comparing costs associated between a private infrastructure and a colocation facility tip the balance in favor of colocation.